Dry fried shredded beef or 'gun ban niu rou si' 干煸牛肉絲 is a delicious Sichuan dish. I love dry fried shredded beef. The meat is quite chewy but very tasty. The flavour is very fragrant with a full on spicy flavour; a combination of dried chilli, chilli bean sauce, sichuan pepper and ginger. The celery also given a nice flavour to the dish. Here is my recipe if you are interested. To prepare the beef, remove any gristle. Pat dry the beef with kitchen paper to absorb as much moisture as you can. Cut the beef into thin long strips, as thin and long as possible. No need to marinate. Cut/shred the celery and red pepper into long thin strips too. Cut ginger into matchstick size. Heat oil in wok then add Sichuan peppercorns and dried chillies. Fry till the oil is very fragrant and chillies have turned almost black. Remove the chillies and peppercorns. Keep the chillies to add back to the dish later. Discard the peppercorns unless you like the crunch. While the oil is still very hot, turn the heat up to maximum. Add in the beef and spread it out but do not stir. The oil will start to boil rapidly. 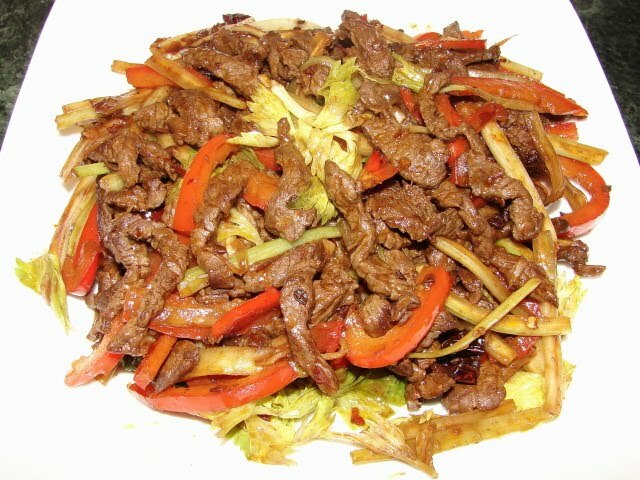 Wait till the oil stop bubbling and becoming clear again, then stir and fry till the beef is lightly brown and crisp a little on the edges. Push the meat to one side, turn the heat down to low. Remove most of the oil and leave about 1 tbsp. Turn the heat back on to high. Add ginger and chilli bean paste and stir fry briefly then add cooking wine. Add in the previously fried dried chilli (and sichuan peppercorns if you like the crunch). Add celery and red pepper and stir fry till vegetables are softened to your liking. Then stir in the celery leaves. Seasoned with enough light soy sauce to taste, pinch of sugar and pinch of ground Sichuan pepper. That looks delicious, I'd like to learn more Sichuan dishes, and this looks like a great start. When you said "shredded about 2 sticks of celerey", are you saying that the meat is as thick as 2 sticks of celerey? The text looks misleading. I've corrected it. What I meant is the beef to be shredded. Looks delicious...I like the fact that there are vegetables in it for a balance diet. Oh yum Sunflower, this sounds truly delicious. Thanks. Thanks for the recipe. I am in the mood for Sichuan food today. I am so making it, right now! BTW, Gan bian si ji dou is my FAV! What a great blog! Keep up the good work. Haven't tried a recipe yet, but plan to do so this week. I used to eat this at House of Cathay in San Jose. since moving 16 years ago, I haven't run in to a restaurant that makes it nearly as good. So I decided to try and make some and found your site. This recipe is perfect. Very simple and easy but perfect texture and taste.